T.S. Eliot writes in The Coctail Party, "You are nothing but a set of obsolete responses. The one thing to do is to do nothing." Not sure what his true perspective is on Buddhism and whatnot, I'm no T.S. Eliot scholar, but that's pretty dharmic to me. A cool vegan site is written about in the NY Times. I found a site that has some pictures of a retreat a while back on Padmasambhava. Bodhipaksa has some good commentary. I found a new blog to read by gambhiradaka. I found a web site that has Yogi Chen's writings translated into English. Meat, the sinful food, is not permitted according to the three vows: the vows of individual liberation, the Bodhisattva vows and the tantric vows. Thus Buddha stated: "I have never approved, do not approve, and will never approve of a meat diet." He declared: "my followers must never eat meat." A Mahayana scripture doesn't lock it from me, but it helps. There are so many reasons for me, but ultimately it just seems unskillful. There's too much accumulation of various arguments. Many people say, "the Dali Lama eats meat." But when he stopped eating meat again, did they notice? Did that sway them? Some people say, "but plants have feelings to." But if they really meant that, they would only eat plants, and not meat which involves more killing of plants than plant eating. I stopped eating meat for the first time when in a nutritional science class, I learned that it was not necessary. Being given free BBQ ribs, my weakness at the time, I went off the bandwagon. My second stint as a vegetarian was when my good friend went to visit a friend who'd become a butcher, and was revolted. He read a book, I read it, and it convinced me. But I felt into some poverty, and felt I could not pass up free food, even if it had meat, and once the seal was broken, I just ate it. Envirnmentalism began to play a role in my not eating meat, beyond the dietary and more straight ethical questions. I've never really had that visceral reaction to a corpse, but I am repulsed by some of the practices. My third time trying to be a vegetarian, I made an exception for fish. I thought: They are free range, and I need protein. I wasn't such a good vegetarian, a nutritionist in training examined my diet and said I was over eating carbohydrates because of a lack of protein. I'd restarted it at the example of my new uncle who is a vegan. He was eating a muffin that obviously had eggs in it. I asked him how he reconciled it? He said he wasn't 100% pure, but he aimed for it, and that even if he was out and fell off the wagon, he got back on. I realized, eating meat once didn't mean that I had to abandon my goals. But I read a book called Cod, and learned about the fishing practices. They drag a net through the water, killing everything. Then they call the market, find out what fish is bringing the most money, because they have quotas and can only take so much. And then they push the dead sea life off the deck back into the dead waters. No more illusions about free range fish. My latest conversion was a combination of FWBO peer pressure (positive in this case) and a deepening feeling about not wanting to eat meat because it just wasn't skillful. One day I summoned the courage and will power and just did it. It was my hardest conversion somehow, maybe because I wasn't playing any more. I would not eat meat any more because of my conviction. I felt ashamed to eat meat. I saw the virtue in Vajramati, Seth and Trebor. I love the New Yorker, even in it's slight decline. There's a good review of a book on vegetarianism. My Christian friends might like to look up the quotes from the Bible. I didn't know that being a vegetarian raises one's IQ, but that being a vegan isn't as good as meat eating. I didn't know that if everyone quit eating meat, it would have more of an envirnmental effect than quitting cars. The book is called The Bloodless Revolution: A Cultural History of Vegetarianism from 1600 to Modern Times. I've always liked Carol J. Adam's book The Sexual Politics of Meat, which talks of the vegetarian subtext in literature, and draws the parallel of treating someone as an object instead of a subject is what meat eaters do, and rapists. My friend Bodhipaksa wrote Vegetarianism: Living a Buddhist life series, which I'm sure to read in the near future. My apologies for mispelling his name in the past in my blog. Jayarava has an essay on A Survey Of Buddhism, available at Windhorse. I just finished the momentus first chapter. I'll also be reading Cittipala's essay. There's also transcrips from seminars. On p. 179 of my edition, Bante mentions an essay on the 5 Hinderances. I found it on line at: The Five Mental Hinderances and their conquest. The NY Times has an article on retreat centers. Unfortunately it doesn't mention Aryaloka which has a healthy retreat schedule. Jayarava writes, "I've got my blog aggregator into beta release - previews at http://fwbo-news.net/grapevine/"
The following books are read in mp3 format, downloadable: The Rainbow Road, Wisdom Beyond Words, Tales of Freedom, * The three jewels, Inconceivable Emancipation, Drama of Cosmic Enlightenment (so far, as of this date). I rejoice in Dharmachari Subhadra's merit! With less hoopla, the first Buddhist member of congress was sworn in. Monday: Morning: 60 minutes Metta. Lunch: 40 minutes 6 Element. Tuesday: Morning: 60 minutes compassion. Lunch: 40 minutes 6 Element. Sangha: MOB or Metta. Wednesday: Morning: 60 minutes sympathetic joy. Lunch: 40 minutes 6 Elements. Thursday: Morning: 60 minutes equanimity. Lunch: 40 minutes 6 Elements. Friday: Morning: 60 Minutes Mindfulness of Breathing. Lunch: 40 minutes metta. Saturday: Morning: 60 minutes Mindfulness of breathing. Mitras: 30 minutes MOB or Metta. Sunday: Morning: 60 minutes Mindfulness of breathing. Vajramati, Alyssa, Seth, Storm King, Hudson River, POW/MIA flag. Me, under a pine, over the Hudson. Overlooking Mt. Taurus: Vajramati, Seth, Steve and Alyssa. 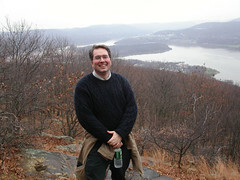 Here I am Dec. 22nd, over the Hudson River, on my way up Mt. Taurus in the Hudson Highlands. Photo taken by Vajramati. 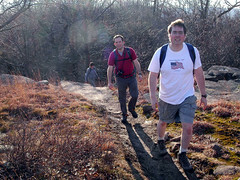 We had our first mitra hike. We'd talked about it, and Seth and Alyssa are outdoorsy people. I picked everyone up and we drove to Breakneck Ridge. 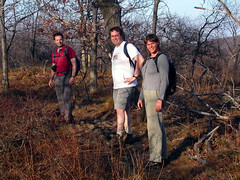 The conversations during hiking I think always are interesting, I think there are thoughts you might not have if you don't hike. I certainly benefit from my association with Vajramati, Alyssa and Seth, and being in nature. Driving back we listened to a wonderful dharma talk on buddhism and death. I think it's safe to say, a fun time was had by all. I want to try and make this a quarterly event. I went to Trebor's wonderful party the night before. Dhammarati's blog references a fascinating article by Vishvapani about growing pains of the FWBO. Compassionate or Non-Violent communication can give you some more tools to fulfill the ideal of the speech precepts. Our NYC-FWBO web site, now has a meditation timer page.